He has pull power, so he will be able to take advantage of Safeco at times, but he doesn’t pound the ball down the right field line like, say, Michael Saunders. He’s going to hit some balls to left center that would have been out of other parks and get run down in Seattle. He’s still worth $2.5 million, but when you hear him described as a “left-handed power bat”, perhaps temper your expectations a bit. He’s not going to be a guy who hits 35 bombs into the right field seats. Also, just because it’s kind of funny, the list of pitchers that Cust hit a home run off last year. There’s a lot of arms who throw 88 on that list. Hopefully, he turns around a few 95 MPH fastballs in April and shows that he’s still got some bat speed left. Looks like 2 of 12 pitchers had an average fastball of 88. How is that a lot of 88mph arms? If anything it looks just the opposite. Is there a site that shows not only HR locations, but other batted ball locations? It would be interesting to see at least fly balls to RF that didn’t turn into HR’s last year but would have in SafeCo (assuming that’s possible–I don’t know the parks very well). Yeah, the relievers on that list can bring it – Linebrink, Pena, Marte are all at or above 94 on their ave. fastball and Delcarmen’s close. Buchholz is at 94 as a starter. Of course, he may not have hit the HRs off of FBs, but looking at his pitch type values, he clearly did better on FBs than curvy stuff. That is kinda what I was thinking. The soft tossers give up a lot of HR (I am generalizing…), so for more then a few to show up there really means nothing. However, there are not many hard-tossing starters on there. Overall… I think the list proves absolutely nothing either way. Very good Dave. One must also consider the flyballs he hit to the warning track in right in Oakland that will now be just enough homeruns in Safeco Field. I expect it all to pretty much even out with maybe a slight increase in HR/FB%. One must also consider the flyballs he hit to the warning track in right in Oakland that will now be just enough homeruns in Safeco Field. I expect it all to pretty much even out with maybe a slight increase in HR/FB%. Blah blah wind in from left field blah blah heavier air blah blah colder blah don’t think so. I’d love for you to be correct and for Cust to have some “wouldn’t have done that in Oakland” homers. I’m just not getting my hopes up. 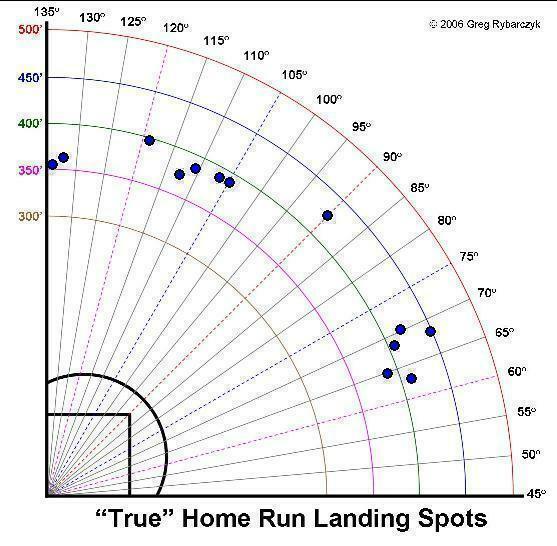 And that year most of his LF homeruns would have been out of Safeco as well (approx. 8 of the 11 to left of Center). He may get more distance going for more of a pure “power type” swing. Hopefully he and the M’s notice the difference, and persuade him to hack away! pitchfx.texasleaguers has charts on outs and hits for batted balls. It looks like there’s only 1 ball Cust hit to deep right that went for an out…maybe one hit, but I think it’s too far towards the alley to get out of Safeco. Looking at Cust’s HRs in 2010, he hit 9 on FBs and 4 on off-speed pitches. The FBs averaged 92.6MPH, with a high of 96.2 thrown by…Brian Bullington (!?). The good news is that Oakland Colosium is harder on RHB than Safeco. This suggests that he has enough power to put it out in left-field, since most RHB are pulling the ball to left. Safeco isn’t the only park that kills hitters.